Dr. Miller, best known for his foal training technique “imprint training”, is a world-renowned speaker and author of Natural Horsemanship. Over the past 25+ years, he has become a mentor to natural horsemanship clinicians around the world. Dr. Miller has an ability to explain how and why training techniques are so effective. Dr. Miller started as a vet in Thousand Oaks, CA and founded the Conejo Valley Veterinary Clinic. After 31 years as a practicing vet, Dr. Miller retired. He has since visited every continent giving lectures to colleges, conventions for animal groups, horse organizations, breed associations and other clients. Dr. Miller is also well known for his books and his sense of humor. He has authored many books including veterinary cartoon books. Dr. Miller has been on the editorial staff of Veterinary Medicine, Modern Veterinary Practice, Veterinary Forum, and Western Horseman and other horse magazines. Western Horsemen Magazine named Dr. Miller 2012 Western Horseman Award Honoree. This award was presented to Dr. Miller at the 2012 Road to the Horse in Murfreesboro, TN. Dr. Miller has numerous books, both educational and funny, as well as videos. Learn more about Dr. Miller, his method of imprint training and involvement in Natural Horsemanship at www.robertmmiller.com. At the Lighthands Horsemanship event Dr. Miller both educates and entertains his audience with lectures. We are honored to be able to spread Dr. Miller’s wealth of knowledge to as large an audience as possible. 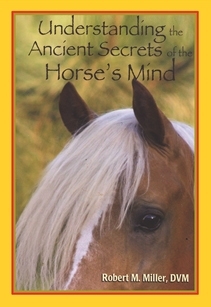 This includes books like this, the Light Hands Horsemanship event and Light Hands Horsemanship video series with dozens of topics available here.